Periodontology or periodontics is a specialty of dentistry that studies the supporting structure of teeth, diseases and conditions that affect them.What is periodontitis? It is a disease that starts from the formation of plaque, a soft, sticky mixture of bacteria, waste products from bacteria and some food debris. Plaque will harden into calculus (otherwise known as tartar) over time. Calculus is mineralized plaque and does not come off with the brush and floss anymore. A combination of plaque and calculus irritate the gums and cause an ongoing state of inflammation called gingivitis. If left untreated, gingivitis can progress to a more serious disease called periodontitis. Periodontal diseases, combined with other risk factors, can lead to the destruction of the supporting bone around the natural teeth. 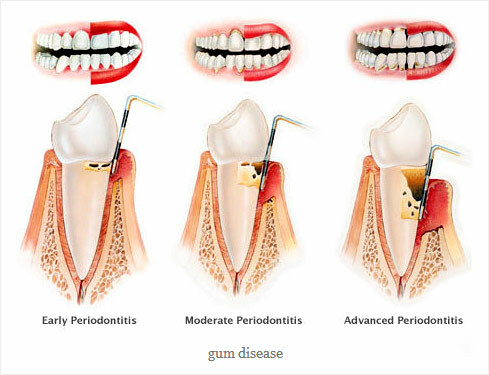 Periodontal diseases range from simple gum inflammation to serious diseases that result in major damage to the soft tissue and bone that support the teeth. In the worst cases, teeth are lost. Removal of plaque is necessary and vital to establish periodontal health. The dentist, periodontist, or dental hygienist removes the plaque through a deep-cleaning method called scaling and root planing. Scaling means scraping off the tartar from above and below the gum line, while root planing gets rid of rough spots on the tooth root where germs gather, and helps remove bacteria that contribute to the disease. It is necessary for the dental surgeon to perform a re-evaluation 4-6 weeks after the initial scaling and root planning, to determine if the treatment was successful in reducing pocket depths and eliminating inflammation. If non-surgical therapy is found to have been unsuccessful in managing signs of disease activity, surgery may be needed to repair the damage. Depending on the severity of the condition, surgical processes may include flap surgery, bone and tissue grafts, etc. The objective of surgery is generally to eliminate pockets, regenerate attachment and to create more normal periodontal form, function and aesthetics. The end result should provide an environment more conducive to oral hygiene and maintenance care so that teeth can be kept for a longer period.